Two Hearts are better one and you are the perfect combination, and so are these combination wine opener and wine stopper favors. They make the perfect gift for your elegant affair. Each elegant solid chrome metal Wine opener and stopper is adorned with a Two open hearts design top. These favors will remind your guests of the perfect combination you are every time they sit down to enjoy their favor vintage. Best of all they come ready for gift giving in a elegant black velvet lined gift box, and finished with an organza ribbon and a double hearts thank you tag. Each measures approximately 4.5in. tall. Sold in a pack of 24 sets. Two Hearts are better one and you are the perfect combination, and so are these combination wine opener and wine stopper favors. They make the perfect gift for your elegant affair. 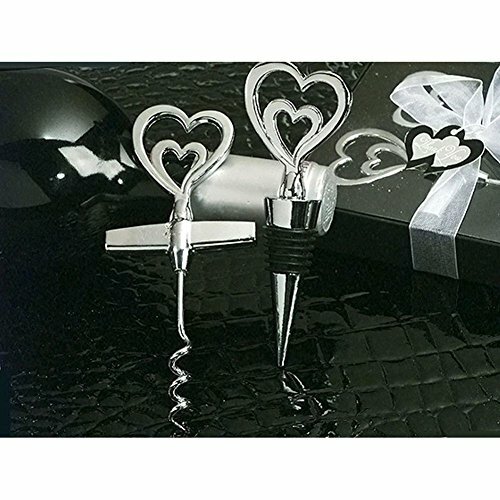 Each elegant solid chrome metal Wine opener and stopper is adorned with a Two open hearts design top. These favors will remind your guests of the perfect combination you are every time they sit down to enjoy their favor vintage. Best of all they come ready for gift giving in a elegant black velvet lined gift box, and finished with an organza ribbon and a double hearts thank you tag. Each measures approximately 4.5in. tall. Sold in a pack of 24 sets.